Hibs boss Pat Fenlon has accused his players of a lack of desire after watching the Easter Road outfit’s six-match unbeaten run brought to a shuddering halt by Scottish Premiership leaders Inverness Caley Thistle. A mix-up between goalkeeper Ben Williams and centre-half Michael Nelson gifted in-form Caley striker Billy McKay an early goal, but their hopes of staging another away-day comeback were dashed as Terry Butcher’s men hit them with a quick-fire double in the second half, McKay claiming his ninth goal of the season hard on the heels of skipper Richie Foran having netted. But while insisting Hibs can prove the setback is nothing more than a “blip”, Fenlon admitted he was bitterly disappointed by the outcome given the Capital club’s recent record. Insisting there was little between the sides in the opening period, Fenlon conceded Caley were well worth their win come the final whistle. He said: “In the second half they were much better and showed more determination and character to win the game. We have been on a good run, but in the second half we did not turn up, didn’t put an effort into it. We did not show enough desire to stop Inverness playing. They put a lot of balls on top of us and picked up a lot of second balls off that. Fenlon, who was seen conducting an immediate post-match analysis on the touchline with his assistant Jimmy Nicholl and coaches Scott Thomson and Alan Maybury, will go into what went wrong in more depth with Hibs’ next match, against Partick Thistle at Firhill, not until next Monday. 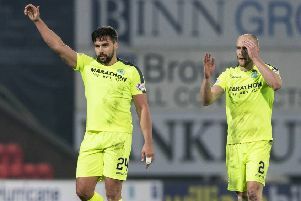 Meanwhile, Paul Cairney, who hasn’t kicked a ball in anger this season after sustaining ankle ligament damage, made his comeback as Hibs clocked up their sixth successive win in the East of Scotland League. Gavin McCaffrey and Ryan Baptie scored to sink Duns 2-1.